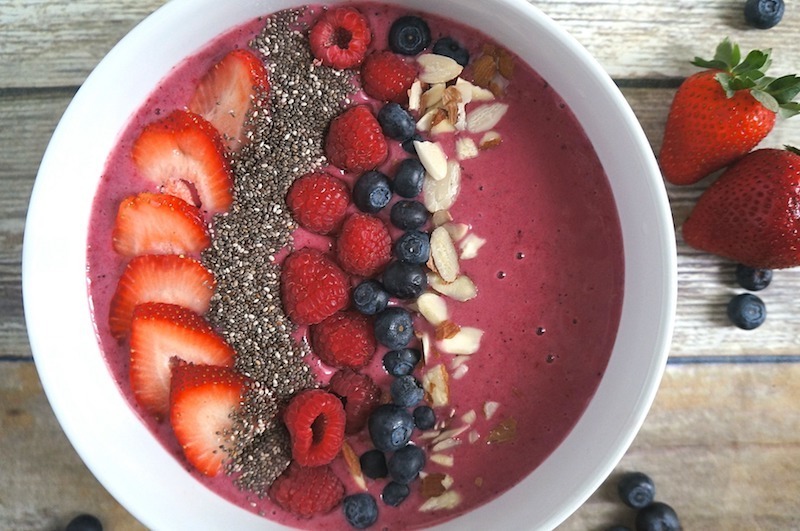 Almond Mixed Berry Smoothie Bowl Recipe - Your Breakfast Is Served! 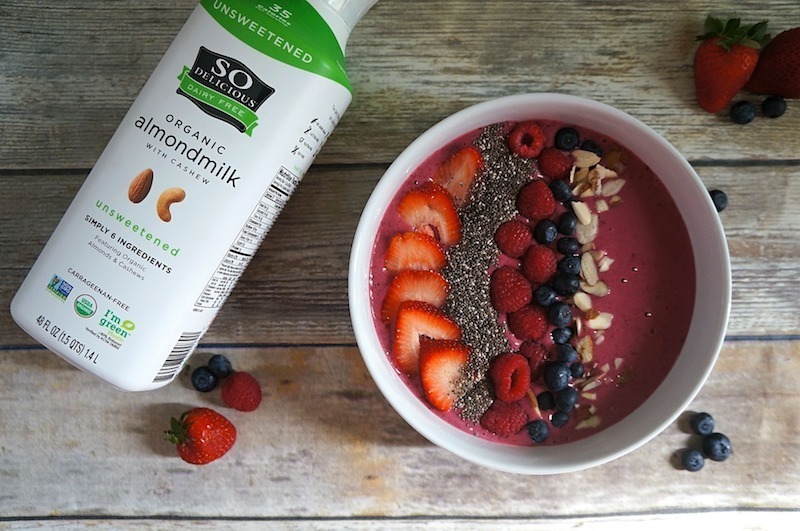 We’re sharing this almond mixed berry smoothie bowl recipe, sponsored by So Delicious Dairy Free. 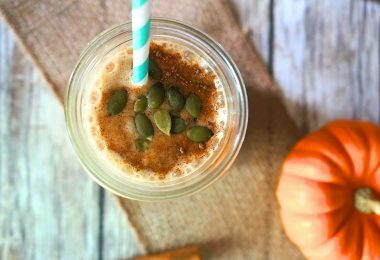 It’s is so delicious that it’s become my new go-to quick and nutritious breakfast! If you have been reading about what I’m up to around here, you know that I have been on a major health kick for the past couple of years. I try to exercise for 30-45 minutes at least 3 days per week, and eat foods that are clean and packed with protein and essential vitamins. I am no longer eating dairy, so I have had to change the way I eat and I really love it so far! I recently tried So Delicious Dairy Free Organic Almondmilk and I am totally in love. It’s nice and creamy, but not too thick, and it tastes really good. 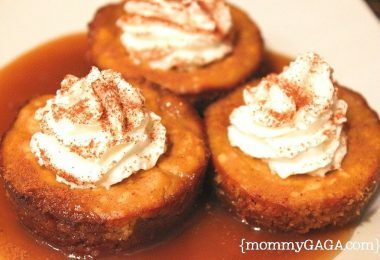 There is an Original and Vanilla flavor, but I buy the unsweetened variety because I like to use it in lots of savory and sweet recipes. Coming up with quick breakfast options has always been a task for me, but not any more! I love this almond mixed berry smoothie bowl that I put together, I can whip it up in a few minutes and it is full of the nutrition I need to start my day. 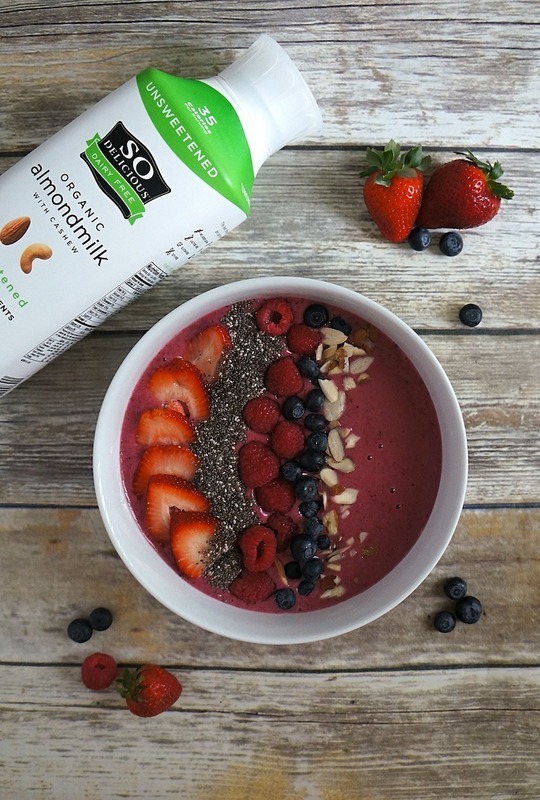 I use the So Delicious Dairy Free Organic Almondmilk as a base for the smoothie bowl recipe, it is a simple, organic nut milk with only 5 ingredients and 35 calories per serving, just the way I like it! It also helps to curb my sweet tooth, which is a plus for me. Try this almond mixed berry smoothie bowl recipe, I got the So Delicious Dairy Free Organic Almondmilk and all of the other ingredients at Target on my weekly trip, easy peasy! First slice your bananas and pop them in the freezer in a plastic zipper bag for about 30 minutes. I usually do this the night before so they are ready when I need them. In a blender, combine So Delicious Dairy Free Organic Almondmilk, bananas, frozen mixed berries, and honey and blend until it is the consistency of a thick smoothie. 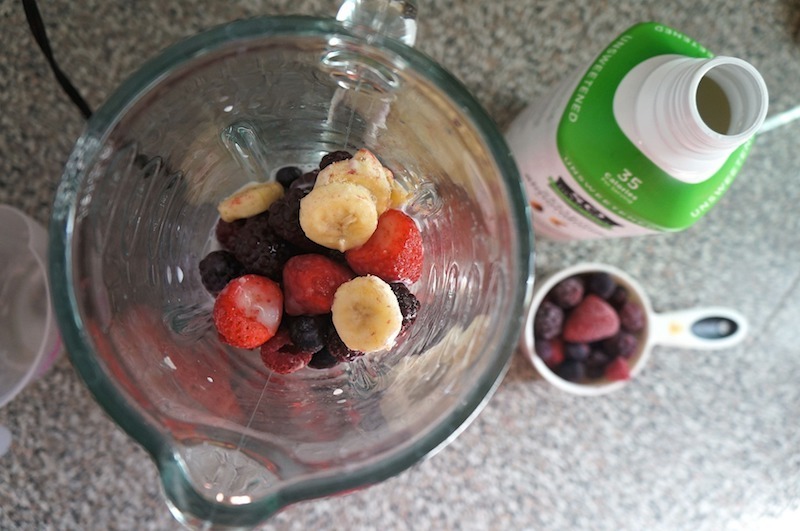 If you like it thicker, you can add more fruit, or if you like it thinner, subtract fruit or add a splash of almondmilk. Pour into two bowls and garnish in rows with fresh berries, almond slices, and chia seeds. That’s it, this easy smoothie bowl is ready to eat! So, what do ya think about my super simple smoothie bowl recipe? 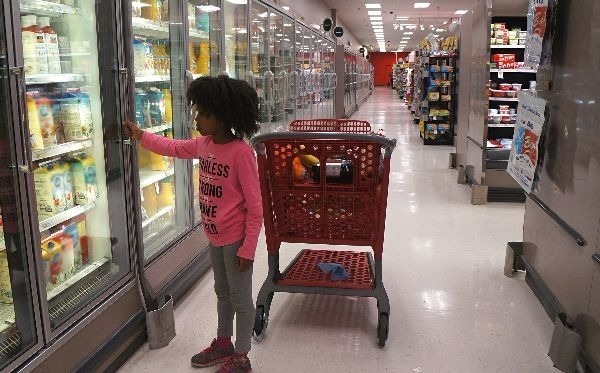 Run and pick up So Delicious Dairy Free Organic Almondmilk, now available at Target. Look out for the 20% off Cartwheel promotion from February 18 through March 17, 2018, only redeemable at Target stores. I’m loving this dairy free drink, it is organic, made with simple ingredients, uses plant-based packaging, and fits in perfectly with my recent switch to a non-dairy lifestyle. I have been using So Delicious Dairy Free in my coffee, smoothies, shakes, and yes, my smoothie bowls! For more information and to find stores near you, visit So Delicious Dairy Free Organic Almondmilk online and follow along with So Delicious Dairy Free on Twitter, Instagram, Pinterest, and Facebook. 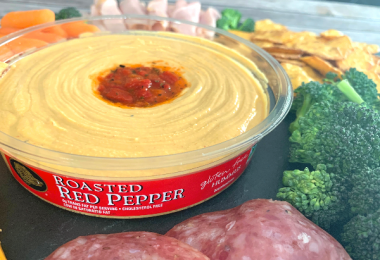 You can follow Target as well on Twitter, Instagram, Pinterest, and Facebook for more promotions and new products to try! Also, if you love this recipe, try this low calorie smoothie bowl with oats with oats, pineapple, mango, and more different flavors! This looks so good! I just need to go get some fresh berries. Thanks for posting this!